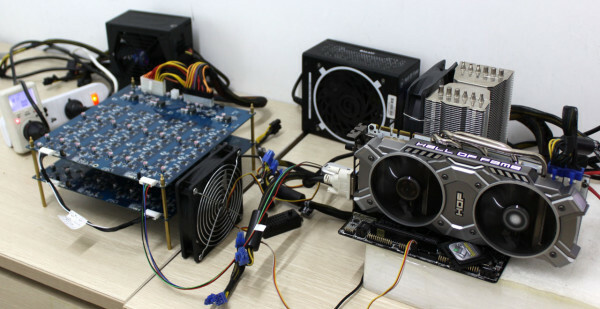 As if it wasn't enough that Litecoin and other Altcoin miners are snapping up AMD graphics cards on all corners of the globe to make their virtual currency, some of the motherboard manufacturers have been getting in on the action with some even offering dedicated motherboards designed specifically for mining purposes and nothing else. Bitcoin's bubble hasn't yet broken and it seems as if the currency is flattening out and making room for itself in the global market. To coin in (ahem) on this craze, Biostar has begun to offer dedicated ASIC miners for use in Bitcoin mining. Well, dude. You know when you make a bag of microwave popcorn? You eventually finish eating all the popcorn in the bag but there's always those kernels at the bottom that haven't popped, so you pan through them one by one until you find some that are half-popped and edible. Oh I see. Damn. What good are miners for other than for mining? What does a machine like that have or contain? PS: Those last edible pieces of popcorn is what I love most if the whole bag. Many of those mining machines have custom build ASICs who are even more efficient at producing hashes than standard GPUs. That's very interesting. I also heard people were using large ARM systems. The main issue I see in mining is trying to sell coins here in SA and convert them into Rs. There isn't a lot of people wanting to buy bitcoins here. Ah. I can buy a bitminer now for R1,500 (Antminer S1 Dual Blade) but I was wondering what I can use from the thing if I do buy it. GFX, PSU, RAM, etc. etc. If it's custom stuff though chances are it'll be fairly useless at gaming, right? Right? From what I understand yes but before you buy it check how many hashes it can produce a second, a little Google will tell you that and then based on the current network difficulty you usually can calculate how much you will make using one of the many websites that help you do that. People think bitcoin mining is viable for income. I's not.. even if you were able to build enough hashes to pay for the power required "at that point you have something the size of a data centre" then you start competing with other massive groups. Hardware codecs "asic's" are lower in power use but are totally underpowered still. Using gpu's work but gpu's are power hungry beasts. What does hash mining get you? pocket change. In it's current state, you have to scale mining up to such an extent that mining really isn't feasible at all if you're trying to make any real cash yeah. It's pretty much just an idiot-trap at this point, considering the amount of disinfo regarding cryptocurrencies out there atm. There are infinitely better, but harder ways to make money via crypto.